Yik Yak, the once universally recognized anonymous social network that virally took over college campuses back in 2014, is planning to lay off a “significant” number of employees, first noted by The Verge. The company is said to be retaining mostly engineers as it notified its team of about 50 employees earlier this morning. In a statement to TechCrunch, Tyler Droll, CEO of Yik Yak, pointed to strategic changes as the cause for the layoffs. While it’s possible that some positions are being shifted around to refocus the company on “local” social networking, declining download metrics tell the story of a company struggling to find its identity and retain user interest. Yik Yak was founded as I started college in 2013. I had front row seats to the app’s rise and fall on one of the largest campuses in America. There was a point in late 2014 when employees and ambassadors were setting up booths around Ann Arbor to give out Yik Yak socks and beer cozies. This was clearly the high point for the app and students ate it up. Unfortunately, the company has since struggled to gain prominence outside the aforementioned demographics. The startup presented itself with an overall “scandalous spring-break” vibe, which proved inaccessible to many users. A group of Yik Yak promoters once marched around UofM with a camera to film students responding to blunt, shock-value, questions. While Yik Yak gets a lot of criticism for being host to offensive anonymous content, it has shown me, on more than one occasion, that anonymity can sometimes have value. Students struggling with overwhelming anxiety, depression and traumatic life events have found solace on the platform. In a single night, Yik Yak’s feed could simultaneously include threats to athletes coming off a bad game and notes of kindness and understanding to other struggling peers. The company never found a way to increase the compassion and put and end to the hate. Efforts to rebrand as more of a “local” social network brought out frustration in users who appreciated the app as purely a place to anonymously vent within a shared community. This, coupled with the success of other emerging networks like Snapchat and Instagram, have almost put the app in its grave. 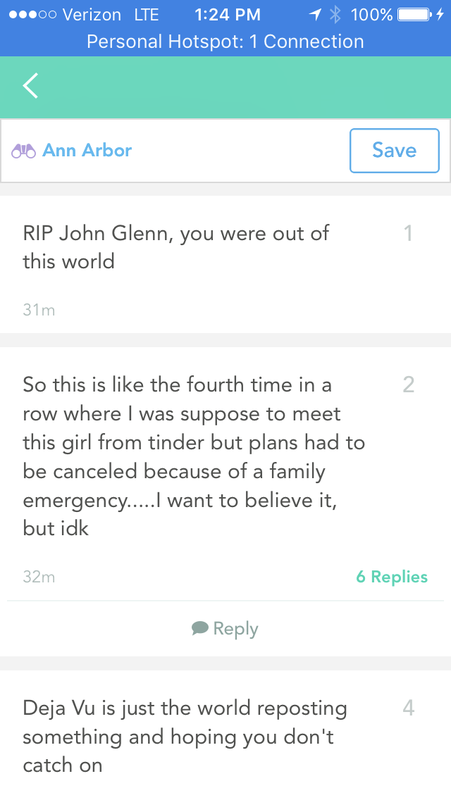 Yik Yak’s current condition is weak. Data pulled from the company’s site via Wayback Machine, indicates that Yik Yak had 23 open positions listed on their careers page this time last year. Today, rather than being higher, the company only has 7 open positions — two of which are for contractors. Ranking statistics pulled from App Annie don’t paint a much brighter picture. Though Yik Yak has shown signs of life at various points throughout its cycles of updates, trusting in the trend, the app has been unable to gain any meaningful traction — particularly in the last few months. Download statistics only seem to make the problem look worse. According to data collected by Sensor Tower, Yik Yak received fewer than 100k downloads last month. That’s worldwide data across both the iOS and Android ecosystems. This time last year that number was over 300k — representing a decline of 76 percent. It’s growing increasingly likely that Yik Yak will fall into complete obscurity, just like the messages of users who anonymously posted on it. That said, I’d still bet a hefty sum that Yik Yak’s failure will create a void that can only be filled by the next niche, risqué, social media platform. We’ve reached out to leadership at Yik Yak and will update this post when we hear back.